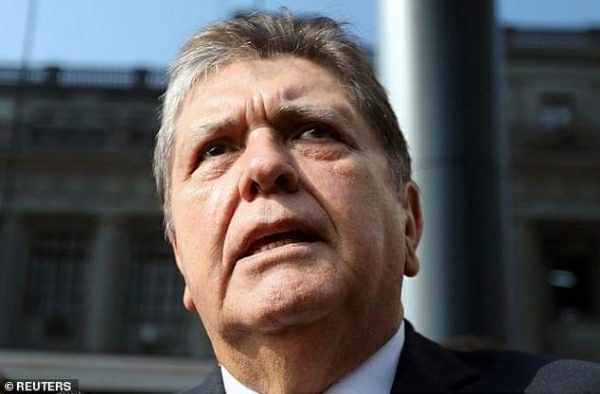 Former president of Peru Alan Garcia has died after shooting himself in the head when police barged down his front door to arrest him for corruption today. Garcia, 69, was supposed to face questioning for alleged money laundering but was rushed to Casimiro Ulloa hospital in Lima after putting a bullet in his skull. As officers moved in to make the arrest, the two-time head of state said that he needed to speak with his lawyer and shut himself in his room before a firearm blast rang out. The ex-premier fought for his life for around three hours, during which time he suffered three cardiac arrests and was resuscitated three times before being pronounced dead. His death has also been confirmed by current President, Martinez Vizcarra. Moran said: “He entered his room and closed the door behind him. Garcia was sent to hospital at 6.45am local time and had been in the operating room since 7.10am. He served two terms as president of Peru, the first from 1985 to 1990 and the second between 2006 and 2011.